Hello dear members and friends of Sicamous United Church. When you are next in the neighbourhood, look up – up to the roof! The new `torched-on’ roof is being installed over the sanctuary which should give the building many more years to serve the community. We have had some wonderful volunteer help to pay for this needed replacement. I am so grateful for your willingness and creativity in making this all happen. 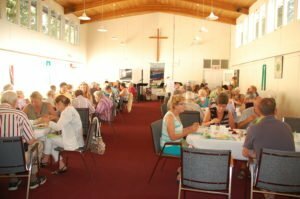 On August 8th, we held a Summer Buffet and served a capacity crowd, raising $931.00 Individual donations have been coming in as well from folks who come in to the Thrift Shop. August 22nd (today) Amanda will be present at Music in the Park at 6:30 PM with fresh baking to sell by donation for the `Raise the Roof’ fund. You can help by baking, yes today, and joining Amanda at the park. Cooler weather today – great for baking! Can’t help today? That’s o.k. We are setting up a bake table this coming Saturday, August 27th at 10:00 AM in the church parking lot. Your contributions will be most welcome. Not all is baking and fund-raising. We continue to be rooted in worship – open to the Sacred Presence as we gather to worship each week. We’ve been blessed with a variety of worship leaders and musicians during the summer. Next Sunday, August 28th, we will be joined by harpist, Sharon Hartwick who will offer some beautiful reflective music on the harp, as well as hymn accompaniment by our 5-piece band of JoAnn, Steve, Wilma, Jim and myself. Come to worship and let your soul be fed.